When we talk of being economical there’s one way of doing it that I think wouldn’t cost you a lot. Look into your kitchen and refrigerator and there you will see left-over foods that can be used or cooked again to prepare a quick meal. 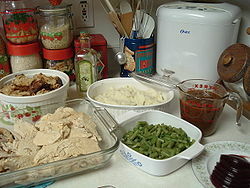 Left over vegetables, meat, poultry, fish, and crab meat are good to serve for luncheon or supper. They are rich in proteins, vitamins, and minerals. You can prepare left-overs for lunch or dinner, to save money and food. When you have left-over crab meat, you can make it into omelette for luncheon or supper. Crab meat may also be sauted with sitsaro or abitsuelas and pork. Left-over boiled vegetables may be served as salads or omelets. Left-over boiled eggplant can be prepared into omelette for supper. Boiled beans can be prepared with mixed vegetable salad. You can prepare appetizing left-over dishes out of meat. You can use left-over chicken meat for chicken salad. However, much food value is lost when cooked food is cooked again. As much as possible, avoid heating the food several times before serving it.